I love Meghan, I love lists, I love showing up three days early for a party (and twice in one week). So let me get all meta here and give you a list…of lists! In review! So there you have it! Somehow Monday and Tuesday have become my new weekend. Wednesday and Thursday are for freelance work, and weekends are for actual “work.” And what else is on the list for today? Oh, a little fitness, a little food, and a little fun–date part two, double woo woo. I’ve tried different apps, but I just love pen & paper. It’s more satisfying to cross off! Although I have to admit, if it’s a list I want with me, I’ll be a complete dork and…take a picture of my handwritten version on my phone so I can reference it without hauling around my big notebook. This is why I love you: because we are so damn similar and I just happen to really fancy myself. 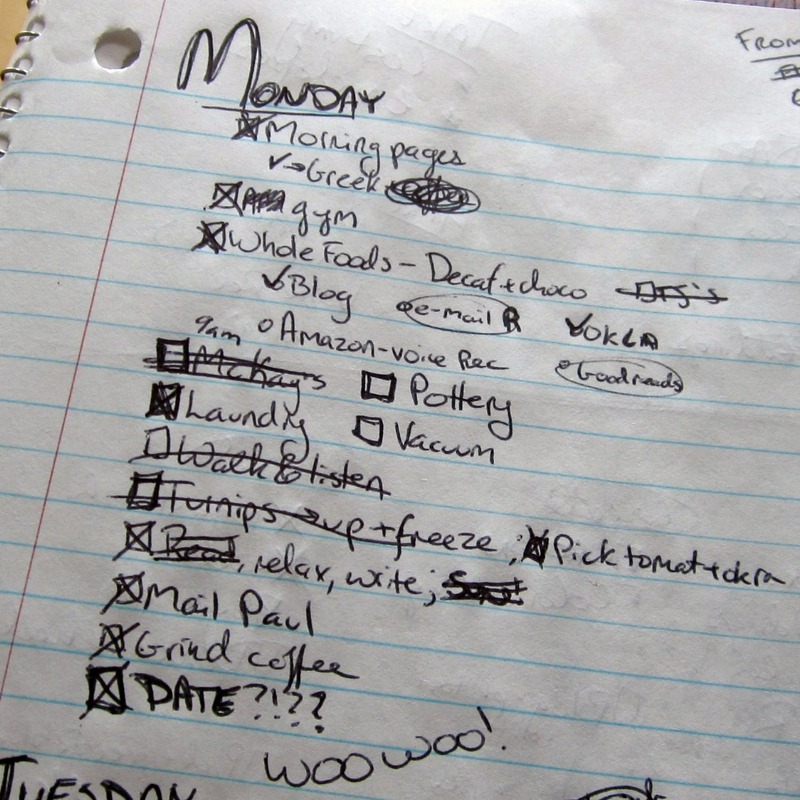 I’m going on vacation next week so I was thinking of making Monday’s Week In Review all about my vacation lists and here you go and do the same-ish thing. I want to know if the WOO WOO came before or after the date because the timing would change the meaning entirely. And here I go stealing your idea–in advance! While at the same time hoping you still post your vacation lists, because I’m nosy about your lists and want to see. Omg I love your lists… I am a list lover what can I say? Who doesn’t love lists? They are organized, fun and oh-so-satisfying to make your way through! Lists are the best ever. And do I spy an item written upside down in that first picture? 🙂 have this huge checklist of all the crap I need to finish for my work launch, and it’s so satisfying to check off all the little boxes and have a visual of what I’m getting done. YAY. So intrigued minds want to know — when do you make your lists? The night before? Morning of? Throughout the week as you have time? And does Monday say “okra?” because I totally read “vodka.” Priorities. 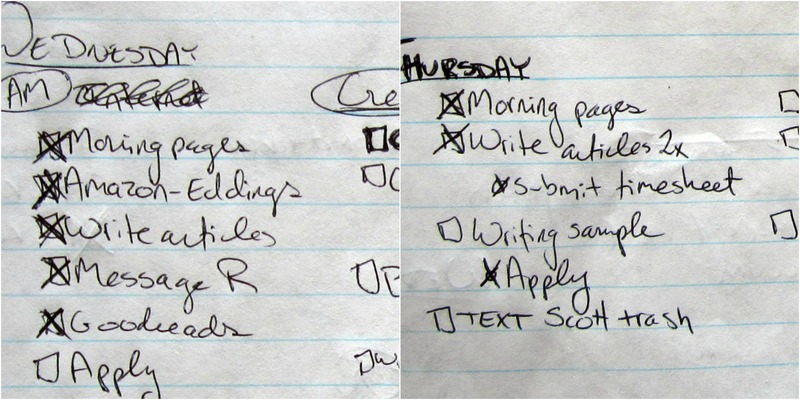 I’d say I generally start each one about 2 days in advance, so I have a 2-3 day spread going at a time for the bigger items, and then the smaller things (like “take a shower”) get added the night before or morning of. It actually says okla, abbreviating cryptic activities. Vodka would have been better. Much better. Wow! First I’m glad you’re not one of those neat handwriting girls…now we can be friends! 😉 I should do this, I might actually accomplish more. I want to hear about the date too! Woo Hoo!! Either way, I like the phrase! I’m a big list person too! Are you just doing freelance work now and no job? I have a constant To-Do list on my phone, that I just keep adding to, and rarely check. I make lists of things like books I need, or recipes I might want to try some day, and foods I might want to pick up at the store. 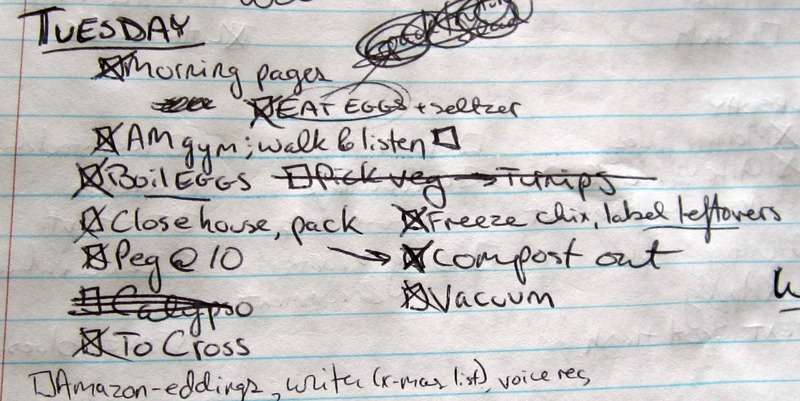 I have a feeling I’ll have to make more detailed lists when I’ve moved and am in Alabama trying to be a PhD student. DATE?!?! Woo hoo INDEED!! Ugh, I definitely didn’t get my Allie fix a couple of weekends ago…we are gonna have to try that again! I feel like we haven’t TALKED in forever! !